During the recent Academy of Veterinary Consultants (AVC) summer conference, Scott Dee, DVM, PhD, director of research with Pipestone Veterinary Services in Minnesota, summarized his company’s research on survival of viral pathogens in feed ingredients. U.S. companies, he notes, import a wide range of feed ingredients such as soy meal, soy oil cake, distillers’ grains, lysine and others from countries where feed biosecurity ranks low as a priority and production systems allow multiple opportunities for exposure of feeds to pathogens. 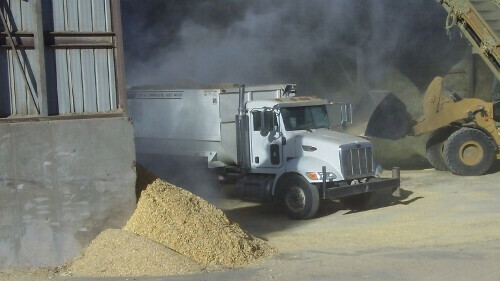 In several feed-exporting countries, Dee says, producers routinely spread soybeans or other feedgrains on public roadways to dry, potentially allowing contamination from livestock or fomites such as trucks using those roads. Previous research demonstrated that the porcine epidemic diarrhea virus (PEDV) can survive in feed. Dee and his colleagues designed their study using a “transboundary model” to test survivability of several other viruses in a variety of feed ingredients. They inoculated feed samples with the viruses and stored the samples in environmental chambers using timetables and temperature controls to simulate the actual time and conditions for feed shipping across common Pacific and Atlantic routes such as from Beijing or Warsaw to Des Moines. Iowa. The found that some viruses remained very stable in certain feeds through the simulated shipping process. For example, the researchers used Seneca Virus as a surrogate for FMDV, because of federal restrictions. They found that Seneca virus survived in most feeds, and the African swine fever virus survived well in soy meal. Some other viral pathogens such as PRRSV, BHV and BVDV did not survive well in feeds. Clearly we need more research in this area and more screening of imported feed ingredients. Lee says further research should include testing actual shipments of imported feeds to determine whether virus survival trends resemble those found in the simulations.